In February 2018, Jennifer A. Nielsen introduced readers to a new heroine in The Traitor’s Game. 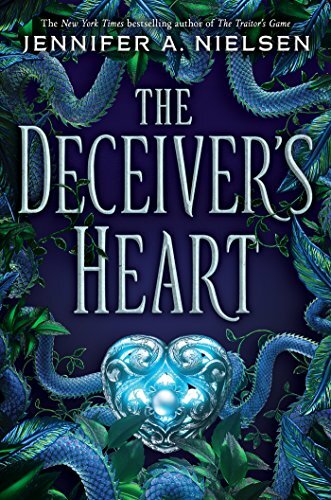 Kestra Dallistor returned to readers’ consciousness this February in The Deceiver’s Heart. In The Traitor’s Game, you meet Kestra Dallisor who is being used as a pawn by Lord Endrick and a band of rebels who want to see Endrick overthrown. Kestra has spent three years exiled to the Lava Fields. When Lord Endrick summons her home, Kestra has no choice but return. The rebels kidnap Kestra as she journeys home, and they give her a choice — help them or she and her servants die. The kidnappers want her to retrieve the lost Olden Blade, the only object that can destroy Endrick. Kestra reluctantly agrees, and then works to undermine the kidnappers. But the deeper Kestra becomes involved, the more she learns. Soon, Kestra finds herself falling for Simon, the young rebel who is assigned to watch over her. By the end, Kestra’s way of thinking is on the opposite side of where she started. In The Deceiver’s Heart, Kestra attempts to destroy Lord Endrick with the Olden Blade. Despite her strength, Kestra fails and falls under the king’s control. Lord Endrick strips Kestra of her memory and forces her to obey him. On the other side of things, Simon is desperate to restore Kestra to the girl he fell in love with, even if that means going against everyone and everything he’s ever cared about. Though I wish I could give you more information about The Deceiver’s Heart, I won’t. That’s because like its predecessor, readers deserve a chance to watch the story unfold on their own. What I can say, though, is that The Deceiver’s Heart is definitely worth your time. I do wish that I had reread The Traitor’s Game prior to reading its sequel. As always, Jennifer’s prose and pacing are spot on. Her world building is strong and her characters are well developed. I’m genuinely looking forward to the next book in this series. © 2019, Cracking the Cover. All rights reserved. Jessica Harrison is the main reviewer behind Cracking the Cover. Prior to creating Cracking the Cover, Jessica worked as the in-house book critic for the Deseret News, a daily newspaper in Salt Lake City. Jessica also worked as a copy editor and general features writer for the paper. Following that, Jessica spent two years with an international company as a social media specialist. She is currently a freelance writer/editor. She is passionate about reading and giving people the tools to make informed decisions in their own book choices. Cracking the Cover is a website dedicated to picture, middle-grade and young-adult books. It features reviews, author interviews and other items of interest. Learn more about our reviewers and check out our review policy. PLEASE NOTE: We are not currently accepting self published books for review. Unless otherwise noted, all books — digital and physical — have been provided by publishers in exchange for honest and unbiased reviews. All thoughts and opinions are those of the reviewer.